A sampling of our products. 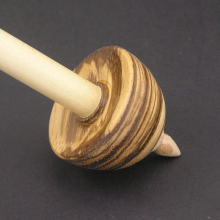 15 years ago, Jim Echter was asked to make drop spindles. Fortunately for him, the Maryland Sheep & Wool Festival was two weeks later. At the festival, he was able to connect with world class spinners and several vendors. They helped him perfect his spindles and many of the vendors became his first wholesale customers that are still representing us today. True Creations wholesales our spindles throughout the US to many fiber shops. However, because of customer demand, all the True Creations fiber tools and accessories are now also available through this on-line shop. Over time, we have added products to our portfolio. First came supported spindles such as our Russians and our Micro and Orenburg style lace spindles. Then the demand for tools such as orifice hooks and support spindle bowls were added. As time went on, we added shawl pins, spindle earrings and a line of collectible spindle ornaments. Always up for a challenge, we have made Navajo and Akha spindles for customers. 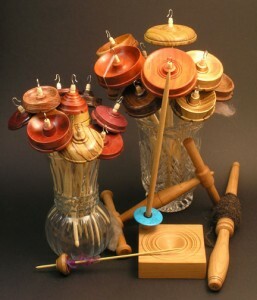 In 2009, a few members of the Genesee Valley Handspinners Guild (Finger Lakes Fiber Festival) stopped by Jim’s studio and asked him to design a kick spindle. They felt strongly that all the current designs on the market did not perform to the levels they desired. Working with this group, design criteria was defined and an initial prototype was made. 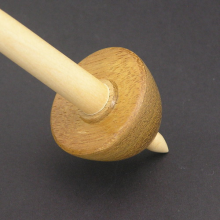 After testing, Jim finalized his design and built his first personal kick spindle. As a piece of “Functional Art”, it performed at high production levels and was beautiful. 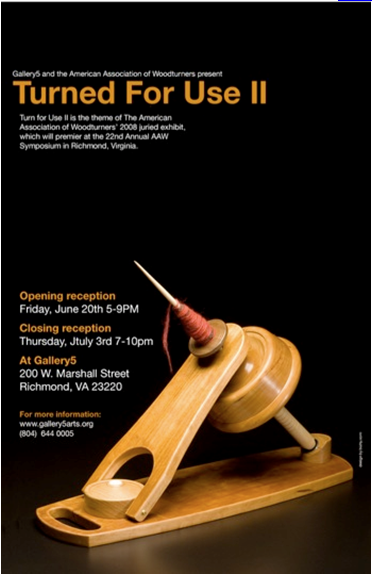 It was entered into the national Association of Woodturners annual symposium’s Turned for Use II show. It was accepted and ended up traveling the country on display for a year. However, Jim wanted to improve on the design and make it fully portable, lighter and, most importantly, self storing. This is the current design now offered by True Creations. It has taken the market by storm. At less than 6 pounds, it is truly a wonderful traveling wheel alternative. There are now customers as far away as Japan, Australia, Scotland and Germany enjoying its portability and performance. You can learn more details about this artful spinner at our main web site: tcturning.com. There you will find a gallery of customer photos, product details and several product videos. See the True Creations Portable Kick Spindle in action. Not only beautiful, our kick spindle is capable of doing production level spinning. Thin, thick, woolen, worsted and art yarns can all be made on our kick spindle. 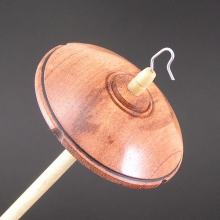 Watch how smooth the balanced flywheel spins the whorl and shaft. One or two kicks to get it spinning and you can rest your leg. Then all your focus is on your drafting, hand position and twist. Enjoy the video while you see it in action. With over 40 years experience in custom woodturning experience, Jim produces his line of True Creations drop spindles and fiber tools. He is also well known for his architectural restoration work and teaches woodturning in his studio. 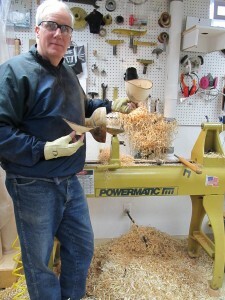 Jim writes articles for the Journal of the American Association of Woodturners. The True Creations’ Woodturning studio is located in the beautiful Finger Lakes Region of Upstate NY. Recently, customer’s have started to demand that we open an on-line store so they could purchase spindles between fiber festivals. So here is our store. We hope you enjoy our skillfully crafted spindles and fiber tools. 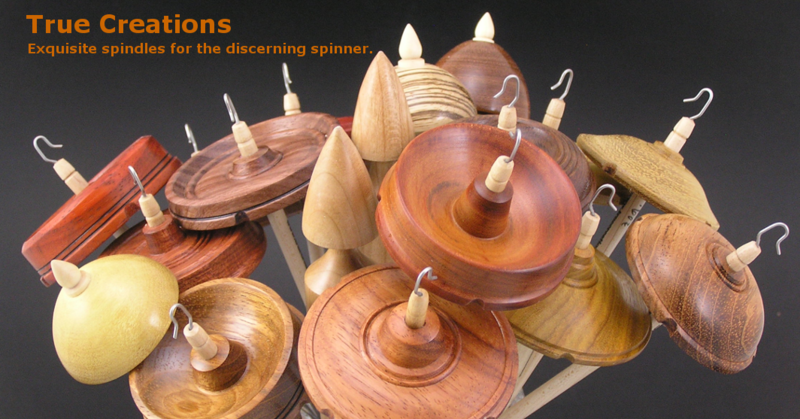 Please tell your spinning friends about us and help spread the word on our wonderfully crafted spindles. As wholesale is still our primary focus, let your local fiber shop know about us. 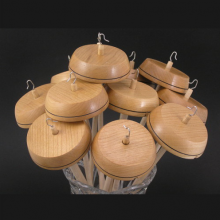 We would love to have our spindles available locally for you to test drive and purchase. Our main woodturning site is: tcturning.com. Please visit to learn more about True Creations, explore our product galleries, watch videos and read articles we have written.